If you have a large lawn, then chances are pretty good that you either own or you are desperate to own a riding lawnmower. Of course, riding lawn mowers are a major investment, and like all major investments you tend to get what you pay for. Sinking a small amount of money into a cheap riding lawnmower is likely to leave you digging back into your wallet again just a year or two down the line. At the same time, conventional riding lawn mowers tend to struggle in curves. You often end up with a ring of fuzzy grass around every tree in your yard, while you constantly have to double back to cut the small tufts of grass left behind whenever you make a tight corner. Enter the Zero Turning Radius riding lawn mower. These units are designed to literally turn on a dime to save you time, money, and frustration. However, not all zero-turn riding mowers are created equal. Just like traditional riding lawn mowers, you tend to get what you pay for. The ARIENS APEX 60 Zero Turn Riding Lawn Mower is built to replace a traditional lawnmower with the kind of durability to last for many years to come. One knock on zero turn lawn mowers in the past, is there potential for grinding up a small area of turf with every turn. This can be frustrating for a homeowner, and downright embarrassing for a professional lawn maintenance company. Fortunately, the ARIENS APEX 60 Zero Turn Riding Lawn Mower has hydrostatic controls that reduce this kind of wear and tear. The ARIENS APEX 60 Zero Turn Riding Lawn Mower has the ability to cut up to four acres in about an hour. The hydrostatic controls and 8 mile per hour top speed give you the ability to cut a lot of ground in a short amount of time, with decreased risk of grinding up the turf. It uses a Consistent-Cut power system technology which allows the operator to manage tall and even damp grass. This allows you the kind of consistent power you need for the perfect cut and a properly manicured lawn. The ARIENS APEX 60 Zero Turn Riding Lawn Mower has an intuitive design that makes it easy to operate. It also has a foot-operated deck lifting system that makes it very easy to adjust the height of the grass you are cutting. It also has 15 quarter-inch increments set to a vertical pin selection. With some time and practice you could probably even use this mower to maintain a golf course. The 25 HP Kohler 7000 Series HD V-Twin-Cylinder Engine offers commercial grade performance. It truly is a zero turn mower. Since it is intended to handle professional grade applications, the ARIENS APEX 60 Zero Turn Riding Lawn Mower’s engine has a bigger everything. This includes critical components like the fuel filter, air filter, and the oil filter. Each part of the filtration system is designed from industrial-grade materials that are meant to maximize safe operation as well as the longevity of the engine. 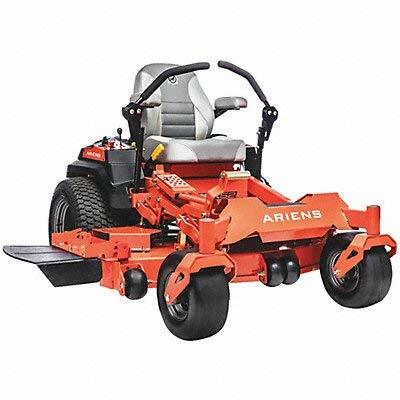 The ARIENS APEX 60 Zero Turn Riding Lawn Mower was designed and built with a tubular frame, as well as a commercial deck that maximizes airflow. The belt tension technology also helps maximize belt life. Like any engine, the 25 HP Kohler 7000 Series HD V-Twin-Cylinder Engine needs periodic oil changes, and filter replacements. The mower blades need to be sharpened seasonally or if you happen to hit something like a big stick or a stray rock. It’s also important to lubricate each of the zerks to make sure all moving components can operate smoothly. Don’t forget to check tire pressure from time to time, especially at the start of the season. The ARIENS APEX 60 Zero Turn Riding Lawn Mower has a belt tensioning system that is designed to maximize the lifespan of the belts. Still no belt can last forever. It’s a good idea to keep an eye on them from time to time. Look for signs of cracking and excess wear. It would also be wise to keep at least one replacement belt on hand, in case one breaks. Like all riding lawnmowers the seat pressure acts like a cutoff switch. The control arms and the high back seat are designed to conform to the operator, which not only helps you stay comfortable during a long mowing session, it also reduces operating errors that can happen when you are dealing with awkward or otherwise uncomfortable controls. The high back seat, armrests, and controls all conform to the operator, which maximizes comfort for long mowing sessions. The belt tension system helps maintain tight belts, which also reduces your overall maintenance time. 15 quarter inch height adjustments that operate with just an ease to use pin system. The ARIENS APEX 60 Zero Turn Riding Lawn Mower’s zero turn capability saves you a lot of time if you have to mow around a lot of trees or other landscaping features. You will have to sink additional costs into things like replacement filters and the occasional oil change, but that’s all par for the course with a riding lawn mower.